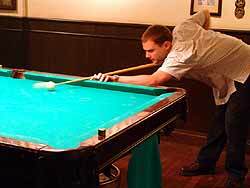 The largest prize purse in the local pool scene attracted a record 32 entries for the knockout tournament at O’Malley’s Irish Pub in the Anusarn Market. Cash prizes totaling 23,000 baht drew a large crowd, with Steve Graham, the managing director of E.S.C. being the donor. 12,000 baht plus a trophy was designated for the overall winner, and smaller amounts for second, third and fourth places respectively, plus food vouchers for the group in the last eight. Tung from Blue Sky Garden. After the final registration drawing took place, round one started on the Saturday afternoon to find the 16 best of three matches, who would advance to round two on the Sunday. These were Tu, Jackie, James, Jay, Mark F., Simon, Tung, Tao, Mark M., Steve, Paul, Bob, A, Kwan, Chris and Jon. The knockouts continued with the quarterfinals drawing even more crowds. The winner, Chris from Rock Hard during the last match. When the last four were announced, being Tu, Tung, Paul and Chris, the applause was momentous. And the madness continued. Six and a half hours after the Sunday competition had begun Tung and Chris made the final frames, which consisted of a best of 7 series to determine the champion and the runner up. 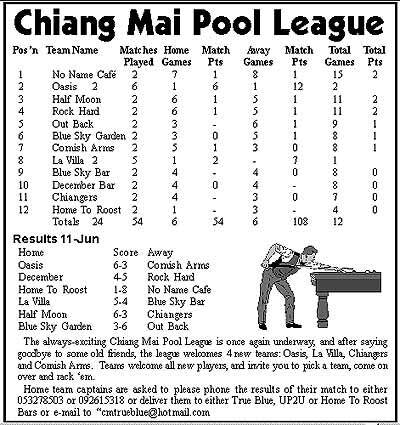 The rules of the tournament following those of the Chiang Mai Pool League. Chris receiving 12,000 baht cash and two trophies from ESC’s representative David Johnson (left). The eventual winner of the ESC European Safety Concepts Pool tournament was Chris from the ‘Rock Hard’ team of the Chiang Mai Pool League. First Runner up was Tung from Blue Sky Garden, 2nd Runner up, Paul, who played for O’Malley’s and the fourth and last cash prize went to Tu from Inter Cafe. 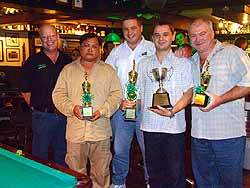 The winners and sponsors, from left: Scott (owner O’Malley’s Irish Pub), Tung (3rd), David Johnson, general manager ESC Chiang Mai, winner Chris and Paul (2nd). The main trophy is a perpetual one, with the winners inscribed and will stay at O’Malley’s. Congratulations are in order for European Safety Concepts (ESC), the new local security and communication specialists, and O’Malley’s for a well organized, fun event. On a blustery afternoon, on a pitch that resembled a battlefield, the Chiang Mai disparate football team tuned out brimming with confidence from their recent victories. The 2.30 kick off kicked off at 4 p.m., and as a result the match had to be shaved down to a mere 70 minutes. If there’s anything commendable to be said about the tardiness of the Chiang Mai league, then it’s that they can always be relied on to be late. A beautiful cross by Chico. The opponents this week were Fawng Kaew, a team that stood one position above the Farangutans in the league, and had in the previous fixture beaten the foreigners 2-0. It wasn’t going to be an easy match. Both teams started at a frenetic pace, with the Farangutans’ indefatigable mid-fielder, Shaun, making some great plays linking with Maseo and Chico. Chico came close to scoring, but the first half ended nil all. Fawng Kaew had few opportunities, and those that came anywhere close were met with a cool insouciance by Farangutans’ keeper, Mark De Fleur. Coach/player Hinsh made some tactical changes in the second half, opting for a more attacking formation. Hinsh unselfishly substituted himself at half-time, it’s rumored the change was in no way connected to the Heineken that the coach availed himself of in the remaining 35 minutes. With can in hand, he screamed, applauded, intoned and threatened from the sidelines. The passing was fluid, and the Farangs more than matched Fawng Kaew for strength and fitness. When you consider the ramshackle, red eyed, rag-tag bunch of hangovers from a year ago, you might say there has been a considerable improvement. 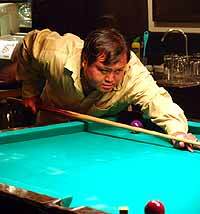 Following the goal the Farangutans piled on the pressure, while Fawng Kaew seemed resigned to a defeat. With an impregnable defense throughout the game, it never looked like the opponents would ever score. The match ended at 1-0 Farangutans. Next week the boys will take on the mighty police force. The police will be looking for revenge, having been defeated only once all season, and that was at the hands of the Farangutans. The last game was of epic proportions, ostensibly on a par with England’s 1966 World Cup victory. 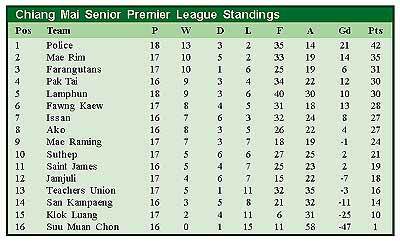 If the Farangs win again, then the chances of being crowned the league champions in their first season is very possible. 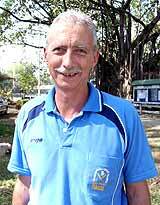 Since the success of the two national tournaments that have been held in Chiang Mai, C.M.S.C.A. have had requests for the Under 13 squad to play as far away as Malaysia and Bangladesh. The boys are eager and want to be ready for these tournaments when they happen. Over the last few weeks David Buck has been putting the squad through their proficiency tests. These tests involve testing their ability at batting, bowling and fielding. The pass standard is quite high and it will probably take approximately three months for the whole squad to get through. It will be worth it though. Cricket Coach David Buck is eager to combine love for cricket with success for his young cricketers! Tony Tree of S.C.S. has donated shirts, trousers and caps with the new Under 13 symbol on them. The boys want to be seen playing in this kit, and are working hard to achieve it. If you would like to see how the boys are progressing, come along to the Gymkhana Golf Club on Sunday, June 27 at 10.30 a.m. when the Under 13 squad will be playing the seniors. This practice match is to help them when they come up against bigger, more experienced players on the tournament circuit. The winners of the Northern region’s "To be Number One Teen Aerobics and Dancercise Thailand Championship 2004" have been announced by Dr. Samai Sirithongthaworn, director of the Ratchanakarin Institute for Children’s Development at Central Airport Plaza in Chiang Mai. About 20 teams participated in the competition organized by the Ministry of Public Health. The representative of the winning Chiang Mai Physical College for the Northern region competition receives a scholarship from Dr. Samai Sirithongthaworn, the director of the Ratchanakarin Institute for Children’s Development. The winner was the Chiang Mai Physical College team which received a scholarship worth 20,000 baht and a shield of honor from the minister of public health, Sudarat Keyuraphan. The first runner-up was the team from Kamphaeng Phet province and second runner-up was the team from Srithana Commercial College in Chiang Mai. The Chiang Mai Physical College in action during the competition. Special awards went to the two teams from Nareerat School in Phrae province and Sukhothai Wittayakom School in Sukhothai province. The regional winners will battle it out in the capital. The Champion of Champions round will take place in Bangkok on July 24 at the MCC Hall, the Mall Ngarm Wongwan. The national winning team will receive a scholarship worth 1,000,000 baht and a shield of honor from Her Royal Highness Princess Ubolratana. The aim of this event is to encourage young people to spend their free time in exercise and dance and to apply their creativity in designing dance steps.